Wish you could take your favorite Tex-Mex cuisine with you on your next excursion? Now you can with Mountain House's Chicken Fajita Bowl! Made with real pieces of tender, cooked chicken, each pouch serves up two delicious servings of goodness with just the right amount of spice. Rice, black beans, bell peppers, corn, onions and seasonings blend together to make this meal all the more satisfying. Wish you could take your favorite Tex-Mex cuisine with you on your next excursion? 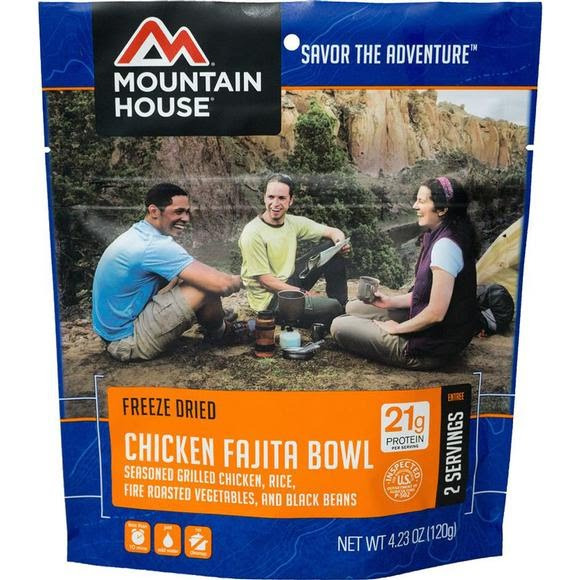 Now you can with Mountain House&apos;s Chicken Fajita Bowl! Made with real pieces of tender, cooked chicken, each pouch serves up two delicious servings of goodness with just the right amount of spice. Rice, black beans, bell peppers, corn, onions and seasonings blend together to make this meal all the more satisfying. Use it to fill up tortillas, or enjoy right out of the pouch! INGREDIENTS: Cooked Chicken (chicken meat, salt), Fire Roasted Vegetables (onion, green pepper, red pepper), Precooked Enriched Rice (rice, niacin, ferric orthophosphate, thiamine mononitrate, folic acid), Black Beans, Corn, Chicken Fat, Fajita Seasoning (spice, salt, dehydrated onion and garlic, tomato powder, sugar, soybean oil, maltodextrin, yeast, paprika, corn syrup solids, natural flavor, modified corn starch, lemon juice solids and lemon oil), Corn Starch, Salt. CONTAINS: Soy. GLUTEN FREE.